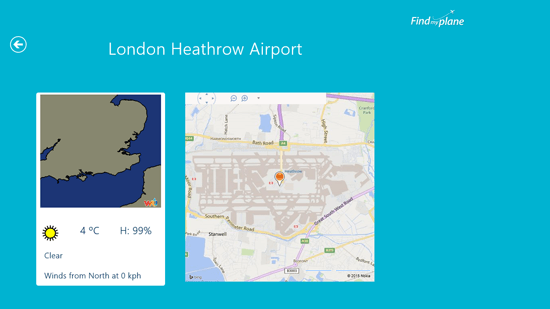 FindMyPlane is a free flight tracking app for your Windows 8 and 8.1 computer. This flight tracking app is really fast and easy to use. It is a powerful tool to keep a track of your flights, flights of your relatives or friends or colleagues. The flights can be tracked using the flight number of your flight and the date it is scheduled for. 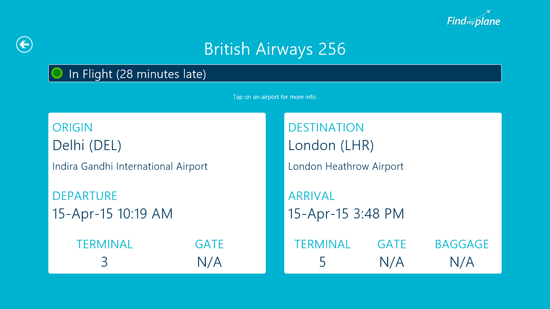 The app takes few seconds and loads the information about your flight on the next screen of it. The information displayed about the flight includes the flight name and number on the top, the time by which it has been delayed. On the left side tile it shows the origin of the flight, the city and airport name, departure date and time of the flight. The terminal from which it will depart and the gate number. On the right side tile, you will see the details about destination city and airport. It also shows arrival date and time of the flight, its terminal, gate and baggage details if available. You can also click on the airport to view more details about it. The weather details about the city of the origin or destination are brought by Weather Underground. The app shows present weather details of the city. It also shows the airport’s map on the right side. On right clicking on the screen of any flight details, you can add it as a favorite or share the information of the flight by clicking on the share button. The details can be shared via email only. On the homepage of FindMyPlane, you can access your favorites by right click and choosing favorites. The app has a nice and simple user-interface that makes it look clean. The color scheme for the flight tracking app has been kept subtle without any bright colors popping onto your face. FindMyPlane is a great choice to track flights easily and quickly right from your Windows 8 and 8.1 desktop. The app is highly recommended for frequent fliers.